[Balmores] Metzgar ran on her own, in friends’ garages for their kids and for the county is now in two Kalaheo locations and spreading. Begun as RAQUAD in 2003, Metzgar says it was such an alternative lifestyle it was as if KUGA were a safe secret place and you just didn’t know they were around. Students as young as four years old up to her oldest student, age 46, participate in classes up to four days a week, year-round. The dancer’s commitment is individual — as much or as little as he or she wants. “Our goal is not to create the next big hit dancer,” says Metzgar. “Through what these students are learning and how they express themselves, they’re learning life skills beyond those of a professional dancer. Check out the photos below — then continue to read more about KUGA, including upcoming events. Metzgar knew from small kid time that she wanted to dance and choreograph, but pursued a career in modeling, becoming an IT girl — international traveler. She learned Pilates and took dance classes. “I paid a lot to take classes as an investment in my dance,” she says. When she moved back to Kaua`i, she didn’t find what she was looking for in dance, “not in the style and way I wanted to move in dance, so a lot of friends of mine were like why don’t you teach it Lila? I think Pilates is a good background to be able share this kind of movement. Her go-getter mom has been a role model as she rose through the ranks in the visitor industry from a switchboard operator with no college education to her fourth position as a general manager, today at Aston at Po`ipu Kai. And if she’s toting up the great role models, Metzgar has a biggie on her side. She says, “The catalyst of it all is God, where I have the faith to take chances. “I know my identity, which gives me confidence to do crazy things. I know even if the task at hand fails, I’m still loved by God. 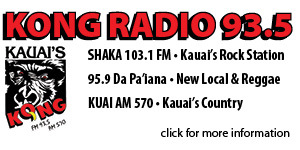 Visit online at kuga808.com for details about classes, jams and the annual Love Life Creative Festival now in its fifth year. For information, Email kuga808@mac.com. On the site, click on the KUGAVA box for the visual arts side of KUGA, located a few doors down.